Robert Napoleon Dal Santo, Field Musician Corporal, born July 29, 1923, Iron Mountain, MI. He enlisted in the USMC Jan. 16, 1943; attended boot training at San Diego, CA and was assigned to Naval Radio Station, Port Blakely, WA, June 11,1943. He reached the rank of field musician corporal. From April 6, 1944-July 20, 1945, he served on the USS West Virginia as part of the Marine Ships Detachment. Aboard ship he served as a bugler and a quad 40 crew member. 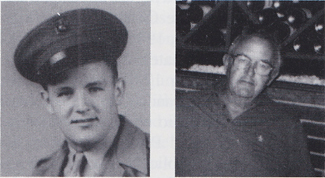 On Jan. 7, 1945, the Wee Vee crew was tasked to pick up the survivors of the USS Hovey. He pulled one of the survivors up who turned out to be a friend from Channing. He was discharged Nov. 2, 1945. Up until Nov. 1, 1985, he and his wife, Lorraine, ran Dal Santos Bar in Channing. He passed away June 1,1995. They had two sons and two daughters.